GrandSport Track Days are for car owners who want to drive in their own street car or racecar in a fun and controlled environment. GrandSport Track Days are designed as a testing grounds to help you build on your driving skills, come out on the track and have some fun and may to also help you decide if you would like to become a member and join ‘The GrandSport Club’ and get all the perks! This is where you can come out and drive four or five laps behind a pace car during lunch hour to see what the track looks and feels like. This is not a speed run but a orientation run. It is $25 and it is limited so sign up now. Bring a friend and they can run the second parade session in your car. All funds gathered from the parade laps will be donated to a local charity. Please arrive and register by 11am for the noon run time. This is for the first timer/beginner drivers. You will learn the basics of high performance driving and track etiquette. This will include 5X20 minute driving sessions with instruction throughout the day! Our instructors will work with you to get you up to speed with the others of your level while having fun learning the basic skills. This is a very structured program and no passing is allowed so that you can concentrate on learning and practicing your new skills. The novice level also includes the all important track etiquette information which includes how to get on and off the track safely, what the flags mean and how to play nice with the other cars on the track. Once you have mastered this level and an instructor has signed you off you can advance to the Bronze group. You may be asked to complete a multiple choice knowledge test before you are allowed on the track. Need a car for the track for the GrandSport Track day? Click here purchase the Novice program and a Track Car to use for the day! Choose a Corvette C5 or Porsche 911 for the day! The bronze group is for drivers with limited track experience from other track organizations or those that have advanced from the Novice Group or another track day organization novice school. Drivers in the Bronze Group will work under the direct supervision of an instructor. An instructor may ride along if asked by the student or an instructor may request to ride long with any driver in this group to help them improved their skills. Drivers may lap on their own if the instructor feels they are ready. No passing is allowed. If a quicker Bronze Group driver gets slowed behind a train of traffic the quicker driver can pull into the hot pit area and then a track official will place them onto the track in an area where they have more room to run. Sessions will be controlled with flags. If you come with experience from another track day organization you may be asked to complete a multiple choice knowledge test or check out ride before you are allowed on the track. 4X20 minute sessions! 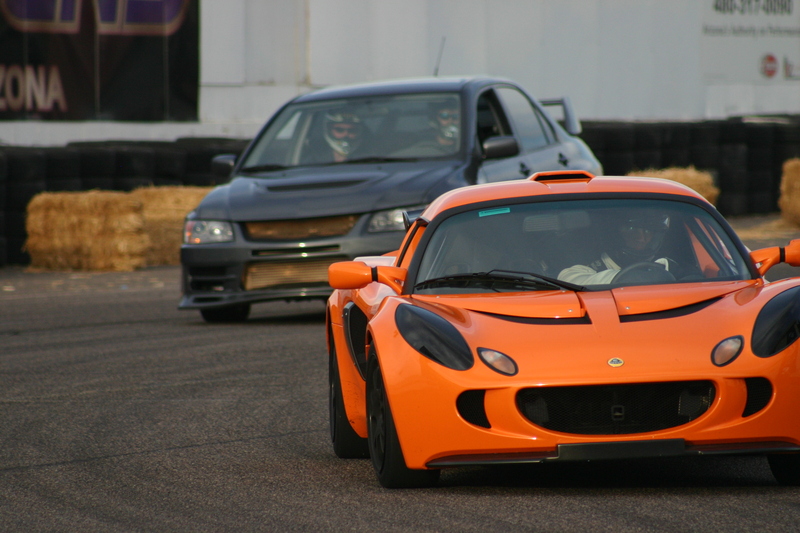 The Silver Group is for drivers who have advanced from the Bronze Group or drivers with several track days experience from other track day organizations. Passing is allowed in designated areas and all passing must be completed with a point-by before a point marked on the track with cones. Sessions will be controlled with flags. If you come with experience from another track day organization you may be asked to complete a multiple choice knowledge test or check out ride before you are allowed on the track. 4X20 minute sessions! In this group you run for free for fun, build your skills and instruct in the other groups. Instructors run with the Gold or race group. We are looking for more instructors and help with administration. Please drop us an email if you are an experience Gold level driver and want to help instruct. FREE TRACK DAYS! – Additionally if you want to help flagging and doing the admin you can also earn your day for free! Technical inspection forms are required to be submitted at the track at check in. The Technical Inspection form can be found by clicking this link. Tech forms are valid for four months from the date of the inspection. If the car has been in an accident a new tech form must be performed. Don’t forget that drivers are responsible for the fitness of their own cars. If your wheels have been removed recently for tire or brake repairs please ensure that your wheels have been re-torqued properly. Any and all maintenance or repairs you perform at the track are your responsibility and your liability. We will be performing random checks by telephone to the inspection shops and with the mechanics that did your tech inspection. Both the shop and the mechanics must be certified. Anyone found to have illegitimate tech form will be suspended from participating at GrandSport Speedway in any type of event for life. General Preparation for GrandSport Track Days – We recommend you arrive at the track early to ensure you can ready yourself and your car in a calm relaxed manner. Please make sure that you have removed all excess items from your car(including the trunk) before you leave home and arrive at the track with a full tank of gas. Check that your tire pressures are correct with the amount of air as stated in your drivers manual or in your door jamb. We are often asked if track day insurance is available for your car through us. We do not supply insurance for your car while it is on the racetrack. However, if you enter a search on the internet for track day car insurance a few companies will come up and can supply you insurance for your track day. Your standard car insurance policy may not cover you while on the racetrack. All participants are required to attend the 8am drivers Meeting. There may be new and important information discussed and questions answered. Failure to attend may lead to exclusion from the event. Roll call will be conducted. Registration: GrandSport reserves the right to class cars as desired and remove or add certain run groups depending on numbers on the day of the event. Please notice there is no lag time between sessions. As one group comes off the next will go. GrandSport reserves the right to disallow or cancel your track day at any time. Advance registration on the internet is required. Click here for our shopping cart or you can give us a call at (409)986-7223 if you have any questions. We prefer that you register in advance of the event on our shopping cart so we can plan resources for the day. Upon arrival at the track please show the admin person at the track your drivers license, completed Registration Form and Tech Form and then you are ready to go! If space is available you may register at the track the day of the event for an additional $25 to the regular track fee. This fee must be paid in cash. Click here to see a lap of the track! Green – Green means the track is open for speed. Yellow – Incident flag. Someone may have spun on the track. Proceed with caution, no passing allowed until you see a green flag at the next marshaling station. A waving yellow means either you are very close to an incident or there is debris on the track! Blue – Waving blue means there is a faster car behind you. Stay on line and they will get around you. Under no circumstances should you pull off line to allow a faster car to pass. Red Flag. A serious incident has occurred on track. Slow down as quickly and safely as possible and move to the inside of the track and stop. White flag can mean one of a few different things depending on the organization. At GrandSport this flag will indicate last lap. Some organization use the white flag when there is a safety vehicle on the track. If the meatball flag waved or pointed at you means that something is wrong with your car. Complete the lap and bring the your car in the pits for a consultation with the pit marshal. Changing track conditions or debris on the track. Be aware that the track surface may change. Checkered – Session over. Complete your lap and come into the pits. DRIVERS MEETING – Everyone must attend drivers meeting at 8am before the event begins. SPINS – Its OK it happens. Most people spin now and then! If you spin somewhere on the the track proceed farther off the track and turn around to get a better view of the track and stop and look. Then orient yourself and check the track for traffic. When it is safe pull back onto the track and you must proceed into the pits to talk to the pit marshal. If you spin three times may be asked to come back another day. CAR BREAKDOWNS – If your car breaks down out on the track please stay inside the car where you are safe surrounded by lots of metal. KEEP YOUR SEAT BELT BUCKLED AND YOUR HELMET ON! It is better to let your car roll off the track onto the grass to a safe place rather than sit on the track. We will see you are stopped and throw a yellow or red flag and come and get you. If you get out of your car you will be done for the day. Exceptions – If your car is on fire get out. Do not try to fight the fire yourself. We will send out a safety truck. TRACK ENTRY FROM HOT PITS – Cars only go onto track when pointed on at the end of the concrete wall by GrandSport Track Day officials. If you do otherwise your day will be over. PASSENGERS – Due to insurance regulations no passengers are allowed unless they are a track instructor. HELMETS – Are to be worn at all times on the track. Those in open cars must have a full face helmet. Snell SA2010 or M2010 or newer are required. Make sure you fasten your helmet chin strap before pulling onto track. CONVERTIBLES – All cars must have a proper roll bar(s) or manufacturer type pop up roll bars. SHOES – Proper shoes for driving only. No sandals. GENERAL CLOTHING – Nylon/synthetic clothing and shorts are not allowed. Long pants are required while on track. Driver suit suggested. We run in all but severe rain conditions. Driving in the rain will allow you to improve certain driving skills. In the unlikely event of a rain-out No refunds will be given, all sales final. Rain-checks will be issued. If you must change your date you will receive a credit to a future event of your choice. You can only change a date once. There is a $25 fee for changing a date. Internet registration closes at noon the day before the event to allow for administration of the event. You can register at the track if there is room in your desired group for an additional $25. Must be paid in cash.